Take a look at Christopher Nevinson's painting "Bursting Shell" (1915) above, which depicts a victim's-eye-view of a World War I mortar explosion. It's safe to say that Alfred Hitchcock, who was familiar enough with Nevinson that he cites the artist as an inspiration for North by Northwest, was also familiar with "Bursting Shell." 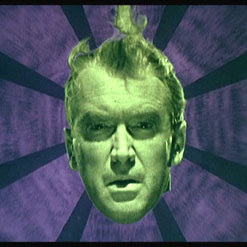 (1) It must surely have inspired the background to Scottie's (James Stewart) "floating head" in the dream sequence. The background behind Scottie's feverish dream-head is rather Nevinsonian, no? The artwork for the dream sequence, along with the portrait of Carlotta (and, presumably, Midge's parody of it), was created by artist and close friend of Hitch's, John Ferren, who also created Marlowe's paintings in The Trouble with Harry. 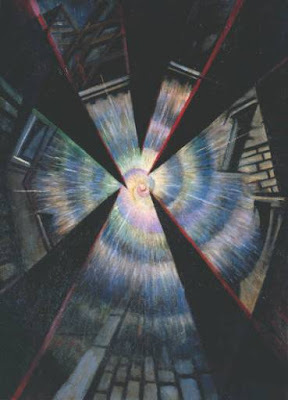 I also see a thematic link between the Nevinson painting and Vertigo. As an Air Force pilot, James Stewart flew and even commanded numerous bombing campaigns over Germany -- including an attack on Schweinfurt, which, due to the high casualties it inflicted, was dubbed "Black Tuesday." These experiences so affected him that, after the war, he considered retiring from such "frivolous" pursuits as acting, and had to be convinced to return to the screen. Still, the roles in his postwar films are much darker than his prewar films. If Stewart saw the painting over which his head would be superimposed in the dream sequence (and I think this is very likely), it would have reminded him of the horrors he inflicted on the Germans 15 years' previously, except that it was a reminder of the real people -- some of them women and children -- who were on the other end of his bombs' trajectories. In other words, seeing "Bursting Shell" could have given him the same queasy feeling Scottie got when seeing Midge's parody of the Madeleine portrait. The US and the British are still ambivalent about the morality of their decision to firebomb German cities. In fact, the horrors of Dresden run a close second to Hiroshima. Rope appears to have explicitly referred to Stewart's ambivalence and shame regarding his participation in the war. These experiences nearly ended his career. You could say that he suffered "moral vertigo." Taken literally, out of the context of the movie, the nightmare image of Stewart's head floating above Nevinson's "Bursting Shell" approximates the feelings of many air force pilots about their role in WWII. Just wanted to say, great post. 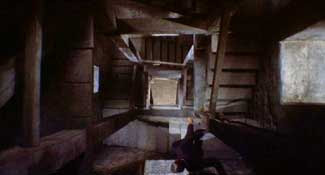 Thanks for shedding new (to me) light on Vertigo and James Stewart's moral vertigo. I thought I knew most everything about my favorite movie and Hitchcock!